If you’re anything like most dog owners, you’re always on the lookout for better ways of looking after your pets, right? That has you facing the difficult question: which dog food is really the best? For starters, we need to understand that there may not be a universal best. After all, the same way your body reacts differently to some food compared to your friend’s, your dog will be the same: unique. That means a bit of trial and error is needed to find the perfect dog food fit. However, there is a second truth you need to realize: some brands, ingredients, and manufacturing methods are simply superior to others.Giving your canine some types of dog food may be similar to you eating candy all the time. Ignoring the marketing jargon and facing the facts is very important. For that, however, you need facts and information to make an informed decision. And that’s what this article is all about. 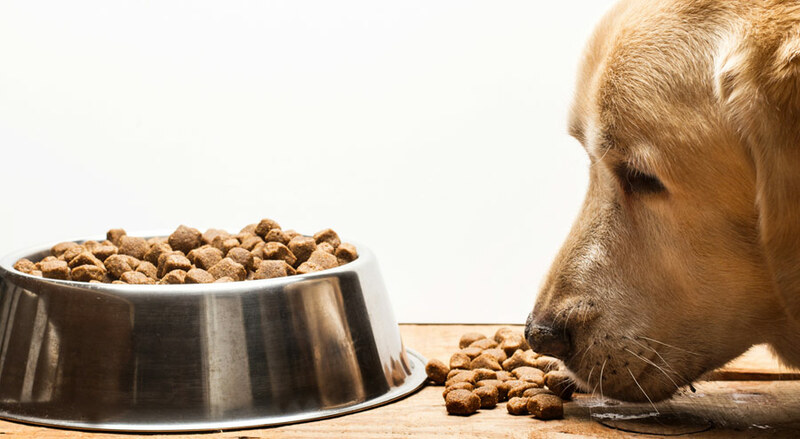 Read on to gain some insight about freeze-dried dog food so you can join the debate of whether it really is one of the better options on today’s market. And when you find this could be what you and your dog have been looking for, pick one of our favorite items from the list of reviews below. While you look for a healthier lifestyle for yourself, with this information you’ll be able to do the same for your dog. When it’s time to feed this to your dog, you can offer it as treats or rehydrate it when you place it in its bowl. We advise you monitor the consistency as some freeze-dried dog food can have a powdery texture. Rehydrating it may create a porridge type meal which not all dogs will find palatable. Is Freeze-Dried Food Safe To Give To My Dog? The reason why many people put their trust in this food is that the procedure described above doesn’t require preservatives as it stops decay. Preservatives are usually required to prevent organisms from growing in the moisture of food. With freeze dried, there is no moisture, so all your dog gets is pure goodness (as long as you pick food made from quality, fresh ingredients of course). The added benefit is you retain vitamins and enzymes that are often lost during the cooking process. Therefore, the end product has more natural nutrition and there’s less need for supplements. Health benefits for your dog: Your dog’s system benefits from more natural enzymes. No preservatives: Preservatives can affect a dog’s system as its body may not be able to break it down properly or it can worsen allergies. The absence of this spells good news for dogs and their owners. Practical benefits for you: You can take tasty meal ingredients anywhere, even when traveling with your dog. Simply add water when it’s meal time. There’s no mess in the car since there’s no moisture in the bag. Longevity: Freeze-dried dog food has a long shelf life and will even keep longer than kibble. Tasty food: Since fresh ingredients are freeze-dried, it will contain much of its natural flavor. Whether it’s meat, fruits, or vegetables dogs are drawn to natural tastes. Their strong sense of smell and taste will have them fall in love with the food naturally. This means you won’t have trouble getting them to eat at meal times. You may also spend less on additional meal items such as gravy to make food more attractive. As mentioned above, all bodies (dogs and humans) differ. Your dog may not respond well to even the best freeze-dried dog food, especially if the pooch already has a compromised immune system. A safer option for these dogs is usually to try cooked food that digests differently. Because most freeze-dried dog food items aren’t cooked before being frozen and packaged, this can be seen as a raw type of dog food. Raw food is known for its value because it still contains nutrients that are often lost during the hot cooking process of other dog foods. Freeze-dried dog food (if made from nutritious ingredients) can be healthier options than some other products. It still contains many of its original nutrients and fewer preservatives than other types. What Is the Difference Between Freeze-Dried and Dehydrated Dog Food? The two processes draw different amounts of moisture from the food. A dehydration process can take out up to 95% of water while freeze drying takes care of up to 99% of the water. This means it has an even longer shelf life than dehydrated products. Some say it can last up to 30 years. Meal Times: What Does Your Dog Need? Let’s be clear about this. Just because the food you buy is freeze-dried doesn’t mean it’s better than the other items on the shelf. It’s about what the manufacturer placed in the food originally that really matters. The freeze-drying process is just a bonus because you retain more nutritional value during the freeze-drying preparation process compared to other methods (as discussed above). This means you as the dog owner still has to compare the contents of the bag with other types of food to find the best. How Do You Know Your Dog Is Healthy? Did you know your dog will do whatever it takes not to show weakness? A dog instinctively knows it has to act healthy so the rest of the pack (this means you and other dogs it comes in contact with) won’t see it as weak and reject it. That means your dog won’t necessarily signal you if it’s feeling poorly. Coat and skin: If your dog’s skin is dry and it’s shedding more than is common for its breed, it could need more from its diet. Using the right food can also prevent shedding completely. Energy levels: A healthy dog will have energy and the desire to play, run, and engage with you or other dogs. Of course, older dogs have less energy but when you feed it the right products it will have energy well into its later years. Eyes:Healthy dog’s eyes sparkle, they’re not dull. Teeth and bones: When you provide your dog with enough nutrients its bone structure is strong enough to withstand the shock of jumping around and playing. If you’re visiting the vet often because of sprains, broken bones, or broken teeth, it could be due to deficiencies (not your dog’s playfulness). With the right nutrition, bones will be strong and ligaments, as well as muscles, will help protect the bones. Appetite: This factor is based on two aspects. You need to keep meals interesting by feeding your dog tasty meals. This is why more expensive products are worth it. A healthy dog will also have a healthy appetite, getting excited at meal times. If it’s ignoring its food bowl you should visit the vet. Gums: Your dog’s gums will become light pink or even white if it’s getting sick. Check them often and you’ll stay on top of your dog’s health requirements. Freeze-dried dog food will be more likely to retain a lot of the healthy ingredients mentioned above. However, you still have to monitor whether it’s compatible with your dog’s unique body. Use these tips above to gauge whether you’ve made the right decision after picking one of our favorite freeze-dried dog food products below. First off, we appreciate brands that provide you with a wide range of flavors. If this freeze-dried option works for your dog you can keep mealtimes interesting and stimulating by switching between different meat types. You can also get the benefits while avoiding the items you know your dog doesn’t like or may be allergic too, as some dogs have allergic reactions to lamb or fish. The brand uses fresh ingredients such as apples which give nutrients but also carry enticing flavors. Instead of using grains that won’t help your dog much, this brand focuses on healthy items, even adding kale. And the salmon oil does wonders for joints. You can use this for all types of dogs (breeds and sizes) by simply adjusting serving sizes accordingly. Here is another product available in many flavors—find your dog’s favorite to ensure he will be excited about meal times every day. A welcome ingredient on this list is the salmon oil. Apart from helping with joint problems, it contains healthy items such as omega-3 not found in the lamb. Just note that anything containing fish may have a unique smell, so be prepared for that when you add some water to this. Thanks to the freeze-drying process your dog will get all essential calcium from the lamb bones included in this Primal Pet product. 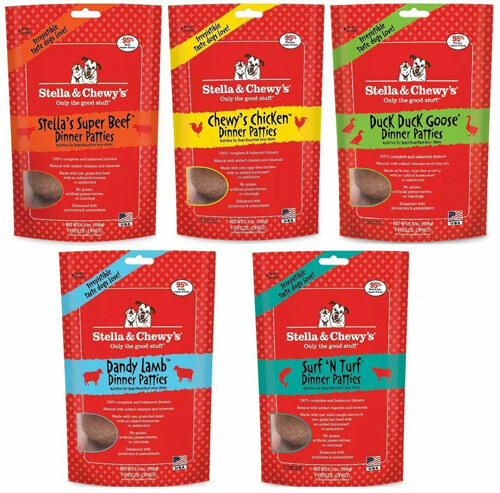 This is Stella &Chewy’ssolution for those dog owners that are really concerned about deficiencies in their dogs currently. The brand took regular Meal Mixers and added superfoods. This doesn’t only spell good news for general health, but can help younger dogs develop much better, setting them up for healthier futures—and fewer visits to the vet. There are no grains or gluten, so it’s practical for dogs with allergies too. This food’s packaging simply screams value for your dog. There are no grains or gluten, so dogs that are prone to show allergic reactions may find a solution for meal times with this brand. The freeze-dried units are of an ideal size for treats, use as rewards while training your dog, or add to your dog’s bowl at meal times. The brand markets it as a complete diet, but note that it doesn’t contain much fruits or vegetables—mostly meat. Depending on your dog’s health and preferences you may have to add some supplements. Yes, dogs in the wild eat mostly meat, but some experts believe plant products should also be included. The brand does add tocopherol and herring oil though: Great for joint and general health. The meat used (in this case, chicken) is farm-raised, free-run chickens, which makes it a healthy option. It’s clear from the list of ingredients that this isn’t one of the purest items on the list, but that doesn’t mean it doesn’t warrant some consideration. 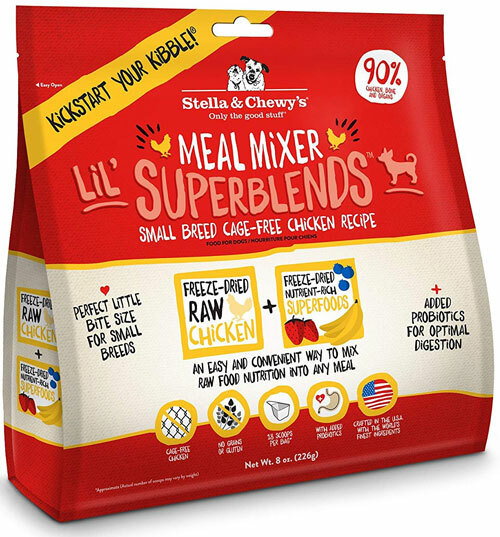 This Stella &Chewy’s product is a pet owner favorite because among the items added you’ll find vitamins and magnesium. If your dog currently has a deficiency, this could be an easy answer. Why easy? Because your dog will love eating this so feeding time is a breeze. The frozen steaks are easy to give to your dog, even when on the road. Some water makes it even more palatable, especially if you’re trying to get a younger dog to enjoy a new adult diet. And, yes, this can work for almost any type of dog, even puppies. Despite it being such a healthy option, this market is quite limited. We believe it should develop as it provides dogs with so much nutrition needed on a daily basis. You’re investing in your dog’s future health if you join the passionate supporters of this range of dog food. 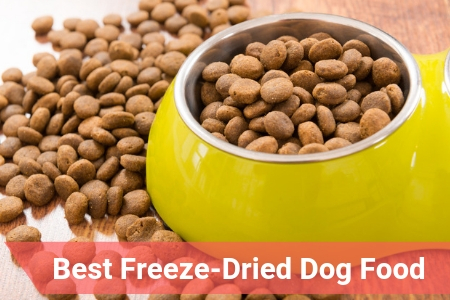 So, did you identify the best freeze-dried dog food for your pup? Order now and remember to introduce it to his dog slowly, not instantly. Mix it in with its current diet so its digestive system adjusts to this new type of meals. It may just be the thing that brings the shine back into those eyes. 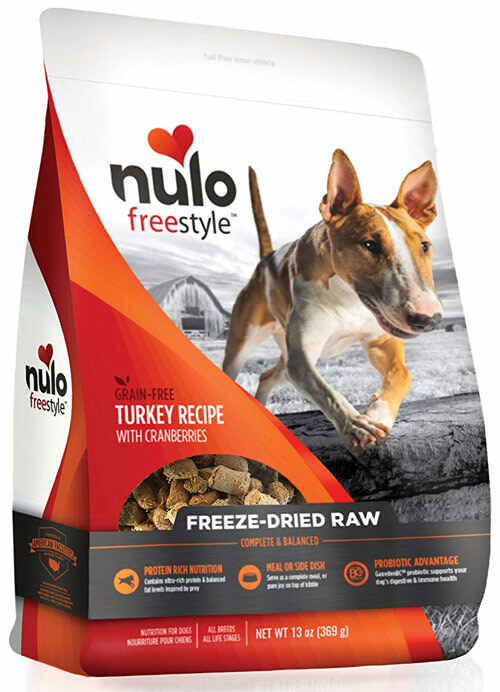 If you have any questions or thoughts on this unique dog food type, please leave them in the comments below. We can all learn from each other to take even better care of man’s best friends. 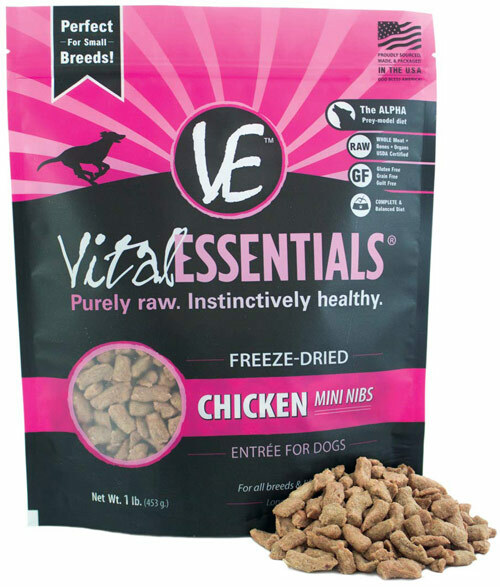 1 What Is Freeze-Dried Dog Food? 2 Is Freeze-Dried Food Safe To Give To My Dog? 5.1 Is Freeze-Dried Food Raw? 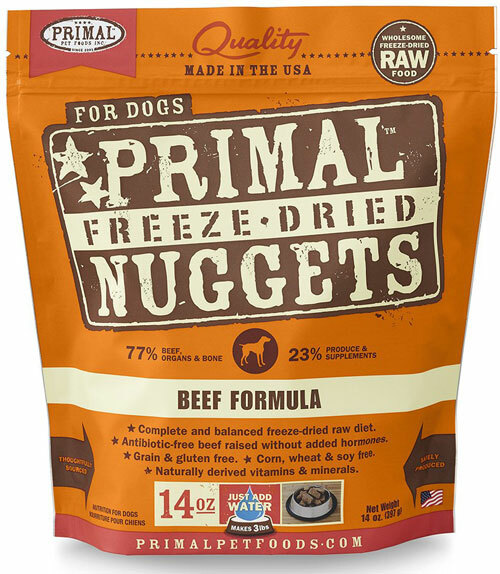 5.2 Is Freeze-Dried Food Healthy? 5.3 What Is the Difference Between Freeze-Dried and Dehydrated Dog Food? 6 Meal Times: What Does Your Dog Need? 6.1 How Do You Know Your Dog Is Healthy?